This is a very popular hike located near Piseco, NY. This short hike follows a well worn trail, sometimes steeply, to an overlook at Echo Cliff on Panther Mountain. As the name states, it is a cliff and you should take care near the edge. Leaving the road and passing the register, the trail climbs steeply along the slope of a ravine. It levels off in a col at 0.5 miles. Be sure to check out the Square Boulder and the Couch Boulder! A great photo opportunity! The trail then turns right and goes uphill with a small creek on the left. The trail will soon turn right and heads up a steep slope, staying on the ridge until leveling off on a narrow hilltop. This is the steepest part of the hike, which can include a scramble near the top. There are great views from the cliffs. Total amount for this out & back hike is 1.8 miles. It is steep at times going up, but nice views at the top and real nice going back down!!! The overall elevation gain is 670 feet for this moderate hike. Don't expect to be alone on the top! We counted well over 100 names on a beautiful Saturday in August in the trail register and passed 25 hikers on our way down on a cloudy Sunday! We hiked early enough where we only saw two others on the top. There are a few pictures, a video and a map of this popular hike in Piseco, NY. There are three state campgrounds, Little Sand Point, Point Comfort, and Poplar Point, that are located relatively close to the trailhead of this hike. 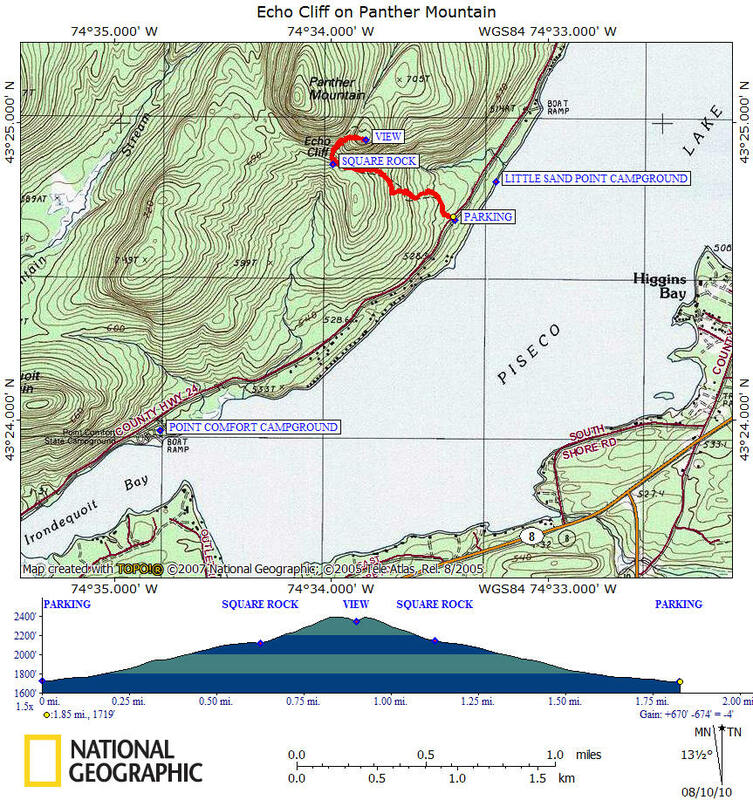 THE TRAILHEAD: From NY 8 at the south end of Piseco Lake, go north on West Shore Rd for 2.6 miles. You will see a DEC sign for Panther Mountain on the left. There is parking on the side of the road. You will most likely see other cars for this extremely popular hike.